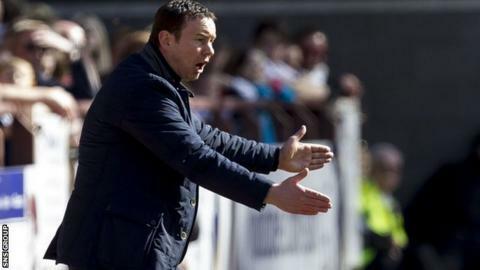 Ross County manager Derek Adams has refused to comment on reports that one of his key players disappeared for several days without explanation. Striker Yoann Arquin, who has scored three goals since signing in January, was absent from the County side that lost 2-0 at Hearts last weekend. Adams also declined to talk about his touchline clash with Jamie Hamill. The Hearts midfielder has been charged with "excessive misconduct" after knocking Adams over at Tynecastle. Hamill was shown a second yellow card following the melee that followed his successful penalty kick and must now face a Scottish FA disciplinary hearing. The defeat in Edinburgh leaves the Staggies in the 11th place play-off spot in the Premiership going into Saturday's home tie against Kilmarnock. However, Adams is confident his side have what it takes both in defence and attack to get back to winning ways and move up the table. "We'll have to be wary of Kris Boyd, there is no doubt, because he has scored a lot of goals in the Premiership since he's come back," he said. "But we've also got players in the team who are capable of scoring. We've got [Melvin] De Leeuw and Arquin. We've got [Filip] Kiss and [Richard] Brittain as well. "We'll have to take chances when they come our way." Despite losing their last two games, Adams said he was "delighted with the team as a whole". He added: "We have done really well since January. We have picked up a lot of points. We drew with Aberdeen here, we went to Celtic Park and drew and we won against St Johnstone. "We have closed the gap on a lot of teams and we are only three points off seventh position. It just happens to be that there are five teams who are very close together. "It's a big game for us [against Kilmarnock]. It's one we want to win. We want to get the three points and move up the league."